Bring me Swamp Thing figures in tribute…THIS I COMMAND. Well, my plan was to talk a little more about the whole Swamp Thing hoohar on Monday, after folks have had more of a chance to read and process the character’s reemergence in this week’s Brightest Day #24. 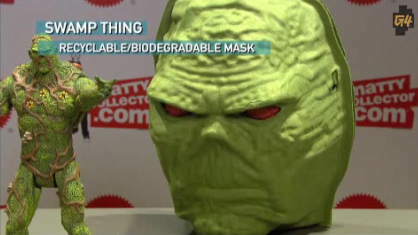 But, as many of you have emailed, commented, and Tweeted at me about in the last 12 or so hours, there’s some other big Swamp Thing news this week: MATTEL SWAMP THING ACTION FIGURE WITH EXCLUSIVE PACKAGING AND ACCESSORIES available only at this year’s San Diego Comic Con! I mean, c’mon, who deserves a Cranius figure more than me? …Well, okay, Wein and Wrightson, but I’m a close third, dammit! So, since it’s about as likely I’ll be able to travel to Mars as to the San Diego Comic Con, I’m gonna have to plan a way to get my mitts on this thing. Plans probably won’t involve murder and mayhem, but I guarantee nothing. …or if that doesn’t work, you can look at the video right here. So apparently there’s going to be an ongoing subplot in the Superman comics about Supes renouncing his U.S. citizenship, causing people who’ve never read Superman comics to threaten to never read Superman comics. Or something. I guess this is really, really important, somehow. Hey, remember that time Superman died and he totally was never going to come back? …Yeah. Andrew has a new Nobody’s Favorites entry featuring one of those characters that everyone’s heard of, but doesn’t make it any less peculiar that the character even existed in the first place. So Kevin Church and Max Riffner contributed a swell four-page story to the Panels for Primates online anthology. Bully, the little bull whom, it seems, is quite stuffed, presents: TALES OF THE SPOILER. Good spoilin’ fun for everyone! Hey, pals Randy and Denise have a new book out: Sketch Card Mania , all about the process in producing those collectible insert cards you find in trading card sets, from two veterans of that industry! Randy and Denise are good people and fun, talented artists, and having seen the book at our shop, I can verify that it looks great. SPECIAL DEAL: if you order from Randy’s site, you will get your copies with original sketches from Randy and Denise. Congrats to those two on the release of their book! Oh, I totally forgot to link to this…my latest article for The Content Farm site: How to Sell Your Soul to the Devil. You know, in case you were wondering how to go about that an’ all. Of COURSE! The birtheres got Obama’s birth certificate, so now they dump on Supes. Superman has no US residency to renounce! He’s an “official*” resident of the world, which is why he needn’t worry about causing international incidents when fighting crime. Guess they ran out of “major” events to grab headlines. *I think the UN granted him such in a story during the Byrne reboot, because every-freaking-body in the DCU knows he’s an alien! From what I can tell, DC themselves didn’t put out any press releases or anything, and the story just got attention when Comics Alliance reported on the interesting story angle after actually reading it off the stands. Seems to me like it’s just a stand-alone short story. John Constantine goes looking for Swampy. He then also joins main-stream DCU. 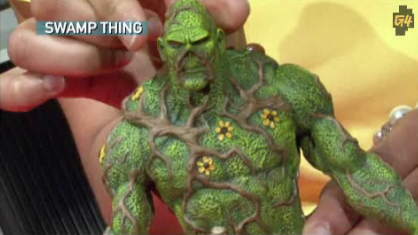 The Swamp Thing figure will be available on Mattel’s toy collector website beginning July 15th. Packaging will be the same, but as you mentioned, you only get the Un-Men if you pick up the SDCC version. These still aren’t better than the awesome Swampy figures that came out when the cartoon was a thing. Glow-in-the-dark Swamp Thing! Hopefully the new boom in Swamp Thing merchandise will include some Swamp Thing chalk. I ran out of Swamp Thing chalk a long time ago and my chalk boards have not been the same ever since. That swamp mask is sooooo awesome! Wish i was going to Comic-con this year! Swamp Thing, what a hippie. I think it’s about time Superman released his birth certificate. I don’t care what his supporters say–I simply don’t believe he was born on this planet. What’s he trying to hide? I’m just grateful that Lex Luthor has been publicizing this scam by mentioning it on his reality show, Celebrity Henchman. Love that Cranius (character and figure too)! In a scared shitless awed way.